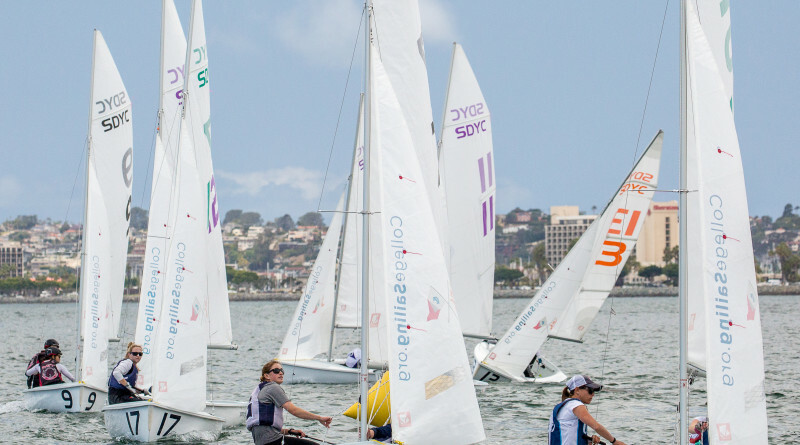 SAN DIEGO — The 2016 Intercollegiate Sailing Association’s (ICSA) series of National Championships was held on San Diego Bay May 24-27 with 36 teams from across the nation competing and only 18 going on to the finals. The Sperry Women’s Semi-Final Championships (May 24-25), co-hosted by San Diego Yacht Club and the Pacific Coast Collegiate Sailing Conference served as the precursor and qualifying event for the Sperry Women’s National Championships (May 26-27). Results for the Women’s Semi-Finals at press time: Final Nine Teams Eastern Semifinal: 1st: University of Rhode Island; 2nd: Boston University; 3rd: University of Vermont; 4th: Boston College; 5th: George Washington University; 6th: Bowdoin College; 7th: Stanford University; 8th: St. Mary’s College of Maryland; 9th: Massachusetts Institute of Technology. Final Nine Teams Western Semifinal: 1st: U.S. Coast Guard Academy; 2nd: Yale University; 3rd: Brown University; 4th: University of California Santa Barbara; 5th: College of Charleston; 6th: Dartmouth College; 7th: University of Wisconsin; 8th: Hobart and William Smith Colleges; 9th: Georgetown University. LONG BEACH — The Long Point Race, the first of the five-weekend Catalina Island Series, was held May 14 with several boats dropping out of the course due to light winds. Crews sailed on a course that started in Long Beach and ended in Spring Long Point on May 14. The second day of racing ended at the club. Race Standings for the first weekend of racing are as follows: PHRF A: 1st: Temptress, Ray Godwin, Long Beach YC; 2nd: Relentless, Jeff Shew/Bill Durant, Long Beach YC; 3rd: Medicine Man, Lisa Meier, Long Beach YC. PHRF B: 1st: Jazz, Mark Itnyre, SLBYC; 2nd: Briar Rose, Les Linkogle, Oceanside YC; 3rd: Onde Amo, Stephen Ashley, SYC. PHRF C: 1st: Lulu, David Booker, SIBYC; 2nd: Day Tripper II, Andy Horning, SIBYC; 3rd: Peacemaker, Mike Price, Alamitos Bay YC. PHRF D: 1st: Giant Slayer, Cole Price, Alamitos Bay YC; 2nd: Hematoma, Scott Kramer, Alamitos Bay YC; 3rd: Wild Cat, Thomas Sanders, SIBYC. Cruising Division: 1st: Miller Time, Wendy Corzine, Long Beach YC; 2nd: Eilander, Mark, Michelle and Jimmy Eiland, Dana Point YC; 3rd: Basante, Martyn Bookwater, Alamitos Bay YC. ORCA: 1st: 1st: Mental Floss, Jeff Cohen, Alamitos Bay YC; 2nd: Trident, Terry Argast, SBYRC. Class XS: Cat20, Randy Reynolds, Lido Isle YC.